I'm glad Seoul officials decided to dump the "HiSeoul" slogan*. Born in October 2002, HiSeoul was underlined with the "Soul of Asia" motto four years later. According to the Chosun Ilbo, the official slogan will be either that one or the less delicate "Soul Seoul". Bonus : the city will be knicknamed "City of Haechi" as a tribute to the fabled lion which gave its brand and logo to Haitai, the famous confectionery company. On Haitai's logo, the lion looks OK, but the original model has a funny look and a stupid smile. I understand the cultural / nationalist motivation and I do like this character, but many may wonder why the World's center for knowledge society wants to be represented by a strange animal apparently plagued with the IQ of a fencepost. The daily newspaper presented Haechi (해치)'s new official portrait : a bubble caricature, probably the fruit of a bad LSD trip by a sci-fi cartoon artist. The two statues planned for Gwanghwamun Plaza will probably look more like the ones which laid there a couple of decades ago. Still, I'm dubious. They just took away the old "bank trees"** in the middle of Sejongno, and I know the new plaza will have no tree - fountains do look nice in the summer but they won't protect you from the blazing sun when you cross this large stretch and they won't be working during the long winters. 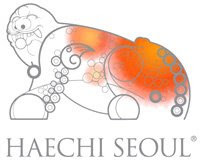 addendum 20080608 : following Hwa Young J's comment, I added the new Haechi logo. PS : pronounce "Haechi" like you sneeze. Strange way of blessing a city. Nice blog. I haven't been in Korea for a year, and have always been interested in how the country/city has been branded. Do you have any pictures of the new Haechi? Thank you. I added the logo, which gained some color in the meanwhile. In a different style, you may have also seen the new international ad for the city featuring a yuppy couple partying in Seoul. Korea finally understood that they should not throw away their past, but embrace it. I agree that Haechi tends to look a bit startled, with a nose that covers half its face and actually it reminds me a little bit of an obese dog. But after reading the story behind it I think that it is a well chosen logo for Seoul. The City of Seoul made a survey and found out that most people in Seoul would choose Gyeongbokgung as the most obvious landmark, and Haechi has been guarding the Royal Palace for ages. In China and Japan it looks more ferocious, but in Korea it actually looks quite likeable due to its chunkiness. There is this very distinct Koreanness to the portrayal of the Haechi logo. They could have chosen a more elegant and refined version, but they chose to keep the original Gyeoungbokgung Haechi traits with all its less than perfect features and I think that Koreans use it tongue-in-cheek. There is this culture of happiness and having fun being silly (looking at traditional masks and madang performances up to today's game shows and performances such as Nanta or Jump) and I think that Haechi represents this culture well. Its original meaning is that of justice and guardianship. The story goes that it instantly can recognise good and bad and that it will tackle anything that's evil with a horn on its forehead. The horn actually looks more like a bump and wouldn't do much harm but deter the bad guy from continuing to behave in this manner. Furthermore it can eat fire and protects from natural disasters, hence its positioning in front of the Royal Palace and its use as guardian of Seoul. I think it's wonderful that Korea finally takes some of its rich symbolism into account and uses some real Korean semiotics. Who knows, it even might become a lovemark over time. Indeed. Haechi is not a specifically Korean character, but he does somehow fit the city. And I'm glad Haechi can eat fire : one Sungnyemun was enough ! PS : best wishes for 2009 and Korea Uncovered !